What are YOUR pets like? Dog Food Advisor › Forums › Off Topic Forum › What are YOUR pets like? Shasta is a 6y.o. Heinz 57. I got him from someone I knew (I’d rather say I rescued him from them…). His dad was a lab/wolf, and his mommy came from a long line of mutts. He has the black/tan coloring like a hound or GS, floppy ears, a fluffy curly tail, loooooong legs, and the biggest prettiest brown eyes ever! He’s an amazing athlete, quite the looker, a sweetie pie, and he loves to learn new tricks! His only downside is the fact that he’s grumpy around any new dogs. Otto was only 2 when he was tragically killed…we actually got Loki shortly after his loss, so Shasta would have a kennel-buddy (Shasta went through severe depression, I honestly wasn’t sure if he’d make it. He acted very ill). Otto was an APBT/Lab/Rott mix. He was an absolute dork, but he sure was handsome (perfect golden/apricot colored. White toes and tail-tip. ), and the most loyal dog I ever knew. I remember once, he broke out of his kennel run while I was away. He was out of it for over 12hrs, and it turned out that he sat by our back door the entire time, waiting for us to come home! I also have some cats, chickens, ducks, a pony, and my 600lb puppy dog… Inigo Montoya was my birthday present last year (dad said no to a horse since he doesn’t like them, but he loved working on a farm w cows…so he got me a calf for my birthday! Quite the odd present, I’d say!). Inigo (Iggy, for short) is an amazing little yearling steer. He loves to cuddle and play, and he knows “come” as well as “wait”. He’s in the process of learning to ride, believe it or not! Cows are amazing creatures…hand-raised pet cows are truly an entirely different SPECIES from your typical herd-bovine. Alright, now you know about my critters… What about /your/ wonderful furry (or feathery…or scaly….) family members? Okay…I’ll go. Warning! It’s gonna be a long post LOL! Lucy Mae – 12.5 year old adopted from a no-kill shelter 11.5 years ago. She’s a mix of Poodle/French Brittany/Chihuahua (finally did a DNA on her), is black and white and looks like a small Border Collie. She’s always weighed in at 24-25 lbs. According to the shelter she was found running in the road (by the shelter President on her way to work), was covered with dirt, oil, mud. She was only in the shelter a month when we adopted her. Didn’t know anything about dogs really and went looking for a puppy with the kids (14 and 12). My husband and I had always had cats. Anyway, we saw Lucy and decided to visit with her. I liked her looks and she was a smaller dog. She immediately put her paw on my leg in the visiting room! We also had a puppy brought in, which proceeded to jump all over Lucy, and wee in the middle of the floor LOL! Lucy was just very quiet and kept up with the paw….so the rest is history hahaha. The shelter was calling her Mae, because that was the month she came to them. They had another May…so. I didn’t especially like the name Mae for a first name (and I always give my animals middle names) so we decided on Lucy Mae. Lucy has done agility work/beginner competitions with me and rally obedience competitions (which she liked and did the best in). She has also been my demo dog when I’ve taught beginner obedience classes. Her temperament, however, has always been so-so. She didn’t know how to climb steps, or walk on carpet when we adopted her. She’s very protective of our house and tends to not like many other dogs, except her Cavvie ladies of course. I have been known to put a yellow ribbon on her leash when out and about, and at the dog club. About a year ago, Lucy developed a mass on her bladder. We decided no surgery (due to her acting very normal and her age). But, I feel it did undermine her immune system and this past Nov./Dec. she developed a very rare form of canine skin cancer called CETL (cutaneous epitheliotropic t-cell lymphoma). It only happens to old dogs (beginning around age 9 and up), no one knows what causes it, no treatments seem to help it and the prognosis is poor (6 mos. to 2 yrs. at most). Also, the dogs don’t seem to be bothered by it much and tend not to die with it per se, and usually the owner has to make the decision to put the dog down due to quality of life. We are taking Lucy Mae one day at a time now and have been blessed with her all these years!! She’s one great dog! Hazel Louise – a 6.5 year old Black and Tan Cavalier King Charles Spaniel. I will give a back story here: When my kids got older and didn’t need me as much I took a part time, 2 day a week, job at a local pet specialty store (which is now a Petco due to a buyout). I feel God led me to the job as it “fell into my lap”, so to speak. This is also where I became knowledgeable about pet nutrition. I had always wanted to do pet therapy work but my mixed breeds (Lucy and Desi (rip)) were not suited in temperament for it. One day I met a breeder of Cavaliers who came into the store monthly to buy their food. She said she had a 5 year old retired show champion that she would love to rehome, if she found the right one…..so….after a few more meetings with her, I finally went to her kennel and met Stella Agnes, my first Cavalier (a Blenheim). Stella was wonderful and I immediately had her certified to be a therapy dog with TDI. We did this for 5 years until Stella could no longer do it and I had a back issue. Stella passed away this past January 13, 2013 at 12 years of age, rip. While Stella was about 7 or 8 the breeder called me to say she had another Cavalier…Hazel, who was 2 years at the time, who she wanted to rehome. Hazel and her brother were purchased from a breeder in England to enhance my friend’s breeding line. When they took all the dogs to Ohio State to be seen by the specialists for testing, Hazel didn’t pass. She had a mild heart murmur, which is prevalent in Cavaliers. Even though she was going to be okay the breeder could not breed her. So, they didn’t really show her either. At age 2 they decided to give her a good home as a beloved pet, so she came to me! She did some therapy visits with me and Stella and did well on them…she’s a shyer dog, though. I was going to get her certified, but when I retired Stella I decided to just wait on it. Hazel is a great dog!!! She is so loving, and she is definitely my shadow. She is my best eater and though she tends to have dry skin in the winter, she is beautiful and shiny with a fish oil supplement. She weighs 19 lbs. and I keep her a perfect weight due to her murmur issue. She is not on any meds and the murmur hasn’t changed since she was 2, thank goodness! She is now certified as a therapy dog and does better than I’d expected due to her being a shyer dog. She has really come in to her own with it. I love Hazel Louise (Hazie as I like to call her) and I hope she continues to do well healthwise….she’s a very special dog! Now, I know this was long-winded and thanks if you read this far. I just wanted to tell you all the whole story. Bless you all! This reply was modified 5 years, 2 months ago by Mom2Cavs. Hi Jan, I loved hearing everyones history!! I was a Vet Tech and dog trainer for many years, so I’ve had more dogs than I can recount here, so I’ll stick with my current ones. Gideon is my first Border Collie, I’ve always had GSDs and Mals, so I was used to the working temperment and the time was finally right for a BC. He is tricolored and will be 3 the middle of next month. We do herding and agility with him and he is just an all around great companion dog. Micah is my second BC, much sharper busier dog than Giddy. He wil be 2 at the beginning of March. He has food intolerance/hypersensitivity issues and is the reason I’ve learned so much about dog food and raw feeding. Angel, my JRT, will be 12 near the end of February, but is in excellent health and acts like a 7 year old. She used to belong to my vet, but her husband didn’t like the terrier personality. She went to another home and was an adoption fail because she harrassed their cats before she found her forever home with us. We also have 4 cats. 13 years ago we adopted 2 feral kittens, Peek-a-boo and Fluffy, thinking we could tame them and then they would be our barn cats. They never really tamed enough that we wanted to risk letting them loose, so they are our house cats, except that they are shy and don’t like the busyness of the house so they mostly hang out in the garage. About 3 years ago, we adopted 2 more kittens, Max and Leroy, from our local kill shelter to be our barn cats. That means they sleep in the tackroom at night, because we have too many animals around here that will kill a cat. And during the day they come up to the house or wander our ten acres as they please. We have 4 horses, Magic, Paint, almost 19, Rose, Haflinger, 9, Felix, Paint, 4, and the little old man, Smokey, mini, 27. We also have 5 goats, Beth, Bell, Liberty, Jubilee, and Remus. And one calf that we haven’t named but we fondly refer to him as Cheeseburger or Chuck Roast, he goes in the freezer in June, and since he uses me like a squeaky toy, I can’t wait. We also run a retirement home for chickens, I think I have 38 right now, more than half are too old to lay, but they will live out their years with us. We had a colony of guinea pigs, but are finally down to just one old lady(Scrabble) left. We also have a ferret, Pogo, a Yellow Nape Amazon, Rain, and a cockatiel, Zigzag, that flew in one day and adopted us. I’ll apologize now for any I have forgotten, but I think you can see why. You have my utmost respect in caring for all these animals. If I had enough room I would have tons more myself. I hope others chime in so I can read all about their animal friends. Btw, Patty…my middle child, Kelly, works at a camp for special needs kids/adults in the summer and they have a mini horse there that is a therapy horse! She loves it! I have taken Stella to the camp, but haven’t taken Laverne and Hazel, yet, but I will. The kids love the dogs. I’ve always wanted to do agility competitions, but both of my boys have horrible temperaments around new dogs :/ I felt SO bad for Loki (my Kelpie/Aussie) because agility would have been THE perfect stimulating sport for him (especially since he’s not allowed to herd our other animals). I talked to a professional trainer (she got to go study with Cesar Millan. Jealous? I think yes! ), she said Loki’s issues will probably never be fixed since it’s a temperament thing, not something that can be solved with just a “no” and a leash tug, or a “good boy” and a treat. Panda,5, and Millie,6, were rescues. They are half-siblings, found at our local paper mill when they were tiny babies. They’re both indoors, but they’re not exactly the nicest of cats. Panda will be lovey-dovey maybe 5min every day? Millie never meows, almost never purrs, and never really enjoys being pet. Panda has the colors of a showeshoe/ragdoll cat (I can’t remember the technical name…it’s basically like a Siamese w a white underside), and Millie? She is the oddest colored cat I’ve ever seen. I think the technical name is “chocolate tortoiseshell”, but you can google “Siamese tortoiseshell” to get a basic idea for it. Then she has a line straight down her face. Half is white, half is dark brown. Maddy is 12 now, she’s also a rescue. Dad found 4 tiny kittens dumped in the woods, so he brought them home. We gave one away within a few months, then one passed away when he was 3-4 (I think he may have had a heart attack. He got scared of EVERYTHING. At night, he’d walk down the hall and see his own shadow, then completely freak out!). Then the third one died just a few months ago…he was an outdoor kitty, so we suspect he got in a fight with something he shouldn’t have. Maddy is a 100% indoor girl though, so she won’t be cougar bait! She’s a very petite kitty, and is a beautiful long-haired silver tabby color. Then we have 7 hens and a rooster. They’re all crack-ups. Who needs TV when you can look out the window and see chickens bumble around? There’s Zsa Zsa and he sister Eva, Lucy (the red hen), Amelia (the flyer), Roxy and Isabelle (black hens), and Phillis (the fluffy white one…seeing any correlation yet?…). Our rooster is “Theadore Roostervelt” or Teddy. Then we also have two ducks, Petunia (named after my favorite children’s book) and Olivia. Our miniature horse is Jazz. She’s about 11y.o. And is a been there, done that, kinda gal. We’ve only had her for a year. Poor girl, I think we are her 4th owners now? She originally was in a home of abuse and neglect, then someone rescued her from that. Then our neighbors ended up with her and rented her out for 4-H. Now we have her. She’s a sweetheart and super gentle, but people definitely aren’t her favorite. She just doesn’t really get bonded to anyone very well, but I can’t blame her! If I had that many people let me down, I’d start to think grass is my only friend too! My cats and my chickens come when called. I agree about how entertaining the chickens are. Mine are free range, but they always watch for us to come out because they know that we always bring them something. I got my mini when he was about 10 yrs old from an abuse situation, so he has trouble trusting new people and gets frightened easily if you move fast, but he is a doll. And I’m not the least bit sorry my calf is going in the freezer!!! He is the biggest jerk, and I can’t count the number of times he has tossed me around, because he thinks I’m his plaything. If I go in with him, I carry something to bop him on he nose with just to keep him off of me. Ginger is our 3.5 year old Brittany. She’s a very sweet but sensitive gal.she came to us from breeders in CT.
Gemma is a 10 ish year old sheltie. We’ve had her a year, she’s our toothless wonder. She came to us from rescue. She had 15 teeth when I met her; she had a spay & a dental and came to us with no teeth! Last is Boone, our pbgv who is 8 years old today. The first few years were hard with him but I can’t imagine life without him! Yes cows get very pushy, that’s for sure! I’m SO glad I taught Iggy a solid “wait”, because cleaning out a stall and pouring grain is very difficult when there’s a giant cow shoving his way around. Sometimes, he slips into the stall before I say “okay”, so I march right in there, slap him on the rear, and he remembers the definition of “wait outside!” Reeeeally fast! We have taught him to respect people though, so he is generally very mellow. Sometimes he tries to roughhouse with us, but he calms down when I tell him to quit. It’s very nice that he’s not pushy to new people, he’s sweet as pie around them! InkedMarie, I’m guessing those are your three doggies in the picture, as the breeds match up. 🙂 they’re all beautiful! Shasta, yep, that is us. That’s our Christmas picture. Not bad for being taken at a pet store, eh? 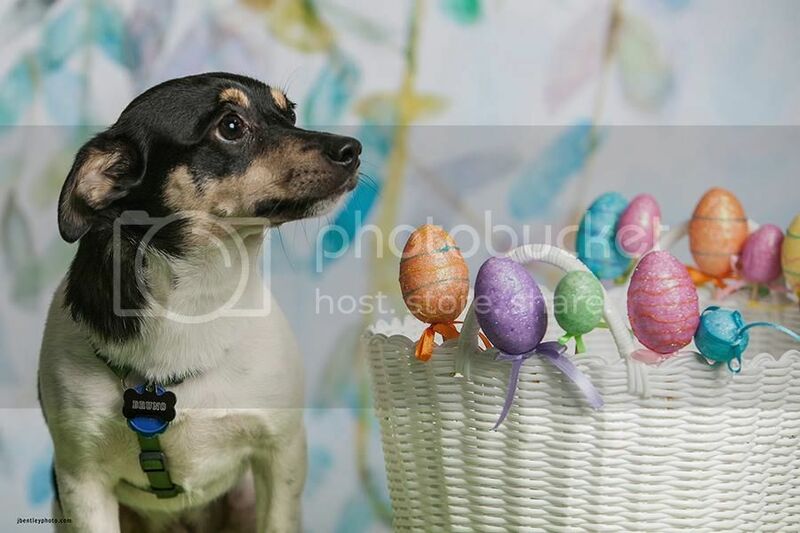 I know this thread doesn’t have too many pics (or none at all) in it, but I wanted to share with you all my poor terrified baby at an Easter photoshoot. He was super scared and barely sat down long enough for 2 shots, lol! He looks so miserable and cute! Enjoy! I also want to add that we have a new addition, Rupert William. Rupert will be 7 years old in July. He is a retired Champion and a stud for my breeder friends’ kennel. He was born in England. Rupert is quite special. He is so affectionate he practically hugs you lol. My husband and son are very smitten with him….maybe it has to do with the fact that they finally have a male pet to keep them company among all the females hahaha! Rupert is a Blenheim and weighs around 20 lbs. but should be about 2 pounds bigger, imho. Hopefully he will be able to get a dental and be neutered after we see the Cardiologist this coming Monday. Unfortunately, my holistic vet is concerned with his heart murmur atm, although he is acting fine. He has fit in with the girls from day one. I love him very much already. He is just soooo adorable! Congrats on the new edition!! He sounds like a lucky guy to have you looking out for him. His face is saying so many things to me! I know you said he was scared but I really think that pic is adorable. Jan, thank you! We sure are smitten over Bruno as well! And congrats to you and Rupert! Hope all is well with him health-wise, and hope he enjoys a wonderful long life with your family! Hi, My Patchy is a little monster when he’s well & not sick, when I say monster he loves people & going shopping with me, I tie him up outside a shop & he’ll see someone & start his crying so they’ll feel sorry for him & come over to say hello, I could kill him, as the whinging can be annoying…He has to say hello to everyone a very friendly boy & loves cats, I also have a big 12 yr old cat called Jeremy, Patch loves his jeremy, he has to be in of a night or Patch wont go to bed…Its funny how these too never grow up together, Ive had Jeremy since a kitten & just got Patch over 1 yr ago they sleep together, eat together like they have grown up together, Before Patch I had rescued a beautiful boxer called Angie then I bought Jeremy as a kitten from the RSPCA, Angie was a real bad cruelty case lived at the RSPCA for 4 months before being adopted out, she was not to be rehomed with any males.. My daughter & I were looking for a dog & my daughter fell in love with her, we filled out all the forms & X our fingers that they would pick us, they had to do a home inspection & she had to go to a 8 week confidence course…I miss my Angie she was so gentle, a real lady, Patch he’s a mans dog real full on, never had any training, it seems like he’s never seen anything & everything is new to him, when I got Patch he had no fur around his neck, where a chain or rope had cut into his neck, he had rope burn marks on both left front & back legs where it look like he must of pulled & the rope & it cut into his legs.. He’s come along way in 1 yr…My animals are my kids I love them to bits..
Gizmo is my only dog. He’s a 7-year-old classic tri-color papillon. I adopted him from PapAdopters and Placement Services on February 16th of this year. He was relinquished to a local shelter because his owner just didn’t have the time for him (she was a business executive that did a lot of travelling and boarded him every time she travelled). He was at the shelter for an entire year before breed rescue got him. He spent a month in a foster home until his adoption. I have 2 cockatiels, Riley, a 5-year-old pied tiel, and Bailey, a 3-year-old pearl tiel. These are my first birds. Riley was acquired from the now defunct Petfinder Classifieds from a couple who ran a photography studio out of their own home. They claimed he was too noisy and distracting so they had no choice in re-homing him. Bailey was purchased from a local breeder. Gizmo has been learning to co-exist with the birds since his adoption.